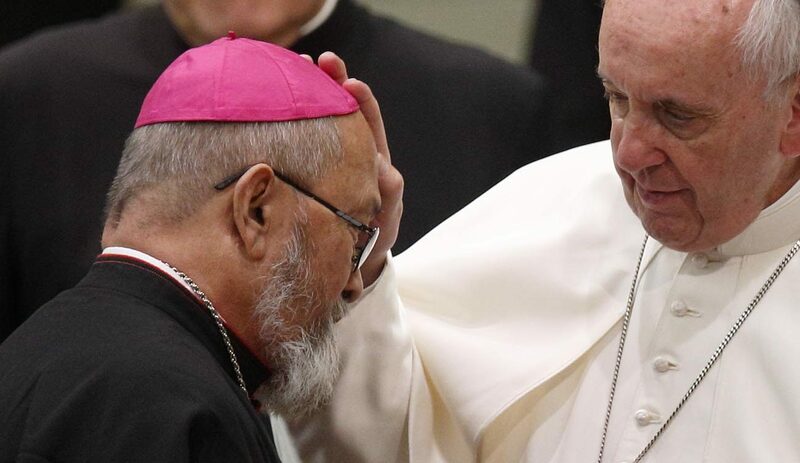 VATICAN CITY (CNS) — Waiting for a Vatican verdict on allegations that he sexually abused several boys in the 1970s, Archbishop Anthony S. Apuron of Agana, Guam, attended one of Pope Francis’ weekly general audiences in February. The archbishop’s presence at the audience Feb. 7 was not announced by the Vatican. However, Vatican media did not attempt to hide his presence in photographs and a video of the audience. The archbishop sat in a wheelchair during the audience. When the cardinals and bishops present on the stage went up to the pope, Archbishop Apuron walked with them, although with some difficulty. Archbishop Apuron continually has denied the abuse allegations. Pope Francis had placed Archbishop Apuron on leave in June 2016 after accusations against the archbishop were made public. The pope named an apostolic administrator to run the archdiocese for several months and then named Coadjutor Archbishop Michael J. Byrnes, a former auxiliary bishop of Detroit, to take over. The Vatican also appointed U.S. Cardinal Raymond L. Burke, a noted canon lawyer, to be presiding judge in the canonical investigation of Archbishop Apuron. Archbishop Byrnes had announced in October that Cardinal Burke and a panel of judges had reached a verdict, but as of Feb. 13, it still had not been made public. In early January, one of Archbishop Apuron’s nephews publicly claimed the archbishop had sexually abused him in 1990. In a statement Jan. 16, Archbishop Apuron strongly denied the allegation. “As I lay sick after another surgery and I face the final judgment approaching evermore close, having lost interest in this world, God is my witness: I deny all allegations of sexual abuse made against me, including this last one,” the archbishop wrote. PREVIOUS: Fleeing gangs in El Salvador, woman finds safe haven in U.S.